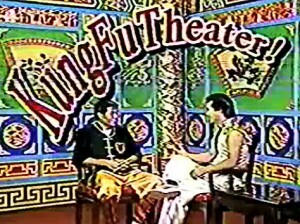 One day, Debbie and I decided to raid our collection of old Kung Fu�Theater VHS tapes and convert them to digital so we could share on�Youtube. 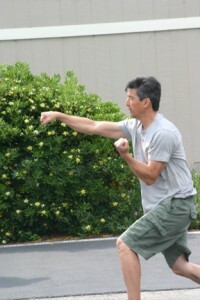 One of these in particular, a demonstration of Yao Kung Moon�style, has brought a surprising number of views. We even heard from Sifu David��Louie, who was the guest and demonstrator on this particular KF Theater, who contacted Plum with a� request for a minor change in the spelling of the style. His warmth and manners shone through his email and we decided to go up and visit�him and his class. Sifu Louie cordially invited us to stay through the entire three-hour�session at his residence in Foster City.�During this time,�I saw a fascinating cross-section of this relatively little-known style, with practitioners at different levels all training hard but, also, having a lot of fun. Some of the youtube comments had mentioned Bak Mei (White Eyebrow�style.) According to Sifu Louie, those who think of YKM as an offshoot�of�Bak Mei�are right, but those who see it as a new creation with a�very old history are also right.This topic came up when I noticed the “dragon body” shape of the horse��stance. Sifu Louie said that was a correct observation, that�besides Bak Mei�Dragon�Boxing was the other main branch contributing to YKM . Many of the��forms, he said, were almost identical to their origin styles; some��have been slightly modified, some are uniquely YKM. Basically the art��is comprised of around 18 hand forms and 28 weapons including the�bench, rake and others. Due to its wide range and depth, Sifu Louie��considers YKM (the Way of Flexible Power)�as a complete style containing sufficient information�rather than just a method or individual approach. The movements of this ostensibly Short Arm system are quick, forceful��yet rather elegant. The hand positions vary hugely with claws, kick�hands, bamboo-cutting hands, palm strikes and more. Even the early��forms demonstrate short, terse but complex footwork with very high�cross stances where both feet are kept flat on the ground. There is a great deal of variance in the hand formations, as you might��expect, but every action is constructed to interlock with just about��everything else. As the student progresses through forms, he or she�might encounter a movement that seems similar to those previously� learned but is linked in a new or different way with other familiar techniques. The hand forms and bridge-to-elbow controls have as many��variations as roses, so variegated are they that YKM can�never become boring. This is confirmed by Sifu Louie’s two coaches/senior students, both���having many years in the art yet supplying lively training and unswerving guidance to the younger students. Style aside, this was one of the times when I had the strongest��feeling of being back in China. His entire group has the village� family feeling where, in the space of the class, everyone interacted�� with everyone. 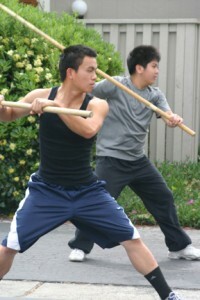 Sifu Louie might be giving a lesson, then be seamlessly�relieved by a senior student stepping in to help the beginner while�Louie walks over to correct another student’s stick move. The newer�� students were not only encouraged to repeat their forms but to do so�� in unison, in the opposite direction from one another and,�surprisingly, at diagonals to one another.�Occasionally, as a young��student performed, Sifu Louie would just walk beside him as if to accompany him through the form. 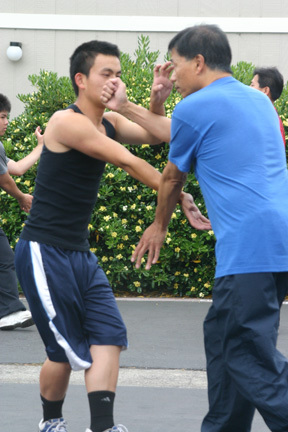 Another method had one of the�instructors walking backward as the young student attacked with his�� form, while the teacher showed the target for each strike and what the�body reaction would be.Students are also introduced to Fa Jin training early. The dynamics of�torso control and leg coordination are specified even for beginners;�students gaining power by integrating their posture and intent. Some�techniques, of course, were easier, such as the opening double fists from�� an early set; some were of a kind that even an advanced player would�� have trouble perfecting. 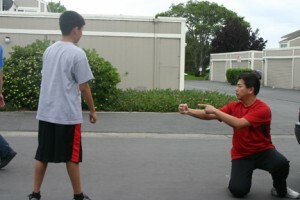 Everything was practiced with an open and� almost jovial air of family participation.I only saw one weapon�the YKM stick�at this session, finding it� impressive, especially due to the number of hand re-positions, tip�exchanges and continual change from move to move. The skill was good,�the intent focused and applications shown. As in the empty hand sets,�the demand for precision seemed to heighten the interest in doing� things correctly, especially under Sifu Louie’s watchful eye. The buzzing of the different conversations, the sound of the shuffling��feet, the sight of the bodies crackling with issued force, the light��rain, the students lining up to synchronize their practice, the��youngest student’s furrowed brow heavy with concentration as he��repeated a cross-step with double palms: all brought back to me the��underground halls, garage studios and training in the parks that I�have seen and experienced myself�over the years. Before we left we talked a while, as instructors will do. Sifu Louie�� spoke of the transformation he saw in the students when they “got it,”�and the look on their faces. 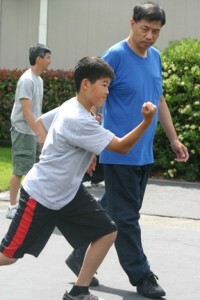 He mentioned that the community of Kung�Fu was essential and helped with a sense of belonging, much like team sports do. Sifu Louie sees the teacher as�instrumental�in this,���modeling his students to create a feeling of unity and participation.��But he also believes that a Sifu should be a fully-trained individual.��In Yau Kung Moon, for instance, it is a position that takes years to attain. He��talked about the Lion Dance as a great binding experience for the��younger students, “who want to climb the Lion�pole,” and he talked�about having something to pass on that is worth passing on. His is definitely a training to consider in an environment of�gentle�but absolute attention�to the art of Yau Kung Moon. Posted May 6, 2013 by Plum Staff. Comments and trackbacks are open. Follow the comments feed. Tagged with: Bak Mei, Pak Mei, Shaolin, White Eyebrow, Yau Kung Men. Great post, thanks for sharing this! Makes me wish I didn’t live on the other side of the country. Thanks Gabe. We are happy to report that there are a lot of fine teachers and good schools out there though they often are hidden in the commercial forest. We intend to expand this feature and, we hope, go further afield to cover those teachers that have so much to give. Keep viewing and commenting, it inspires us. Great article. Brings back memories of the trips we made from San Diego to LA and SF for New Year’s. Thank you for the article. 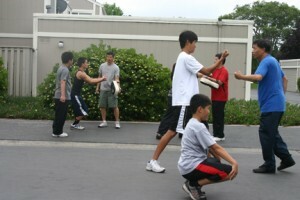 Are there any Yau Kung Mun schools in LA? Great info. Are his classes public? I work in Foster City and am looking for a school nearby – would be grateful for an introduction or contact info. Yes, I believe that he teaches classes publicly, and I will send you his email directly. If you do visit him, please let him know that you saw his information on Plum, and say hello from us! Thomas Kiefer on Where is Bruce?